Chestnut Bread for sale. Buy online at Zingerman's Mail Order. Gourmet Gifts. Food Gifts. All-Michigan version of an Eastern European classic. For much of the last decade Frank Carollo, founder of Zingerman's Bakehouse, has been traveling to Hungary to eat and study its breads and pastries. Chestnuts are a big part of that cuisine—candied whole, as pastes spread on pastries, and as the flour used in bread and baked goods. It's the flour that caught his eye. Usually the food of the poor who couldn't afford wheat, it's got a distinctive flavor and adds great flavor to any baked good its part of. Frank found a chestnut flour from Michigan Chestnut Growers in Grand Haven, Michigan and has blended it with organic wheat flour to make an all-Michigan version of an Eastern European classic. 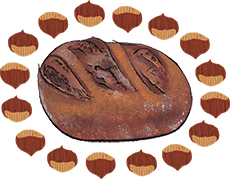 The naturally leavened loaf has a rich tan crust and a nearly purple colored crumb. This is the type of bread you'll want to Instagram. But wait until you taste it. The flavor is full, nutty, sweet, rich—quite unlike anything you've had before, though entirely welcoming.